In Stormblood, Final Fantasy XIV's second expansion, adventure beckons beyond Aldenard. Dangers await in Gyr Abania and the Far East. Will you refine the skills of your time-tested professions, walk the path of the samurai, or perhaps master the arcane arts of the red mage? Choose wisely and journey forth to explore lands unknown. With the additions of swimming and diving, extensive battle system adjustments, and myriad improvements to other pre-existing systems, there is much to see and more to do in the far reaches of Eorzea and beyond! We've released the third installment of our fan kit with even more amazing images from Eorzea! 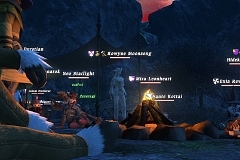 A number of adjustments have been made to the names of items in FINAL FANTASY XIV: A Realm Reborn. * Please be sure to also review previous topics relating to changes in FFXIV: ARR. At long last, the final beta test has begun! This test is open to anyone who registers on the beta tester application site, so if you’re itching to try out FINAL FANTASY XIV: A Realm Reborn, don’t miss out on this opportunity! Proceed to the Beta Tester Application Site. Final Fantasy XIV: New Events, Free Game Time!